Did you know that Little Brownie Bakers make over 4,500,000 Thin Mints Girl Scout Cookies per day during peak baking times? I walked into my office Monday morning , unpacked my belongings, and attempted to open my computer when SLAM! I was greeted by this lovely gift. I have never been one to pass up Girl Scout Cookies. As a matter of fact, just this winter I stepped out of my office on a brutally cold day to pick up lunch, when the next thing I knew, I found myself in the lobby of a random office building in NYC buying girl scout cookies. Sketchy? I think so. I walked back into my office with a now-cold-soup and a box of Thin Mints. Leave it to beaver go to out for lunch and come back with dessert too! Purchasing those girl scout cookies transported me back to my days as a Girl Scout. Well, technically I was a Brownie, but who’s counting? I should clarify that I may have participated in one of the world’s shortest stints as a Brownie. I managed to get a few badges in the process (what for, I have no idea) and then promptly decided that being a Brownie was not for me. I remember the badge ceremony quite vividly; I stood on stage at some random elementary school in my town, attempting to recite the Brownie pledge by heart before receiving my first set of badges. My poor parents and sisters were obviously in the audience, probably rolling their eyes at how mind numbingly boring that ceremony was. So, imagine their excitement and relief when I decided to quit Brownies! Wow, that sounds awful, I’m a Brownie drop out. Not even a Girl Scout drop out (I didn’t make it that far!) but a plain old Brownie drop out. Now that must have been a proud moment in my parents’ lives! I digress…. back to the recipe at hand. So, Monday morning I sat at my desk and without uttering a single word, realizing that I was tasked with making some sort of Thin Mint ice cream. No problem! I’m thinking peppermint ice cream with fudge swirls and thin mint cookie chunks. Delicious. I figured this would be a good combination because who doesn’t like frozen Thin Mints anyhow? This ice cream recipe is really just a natural progression from the cookies themselves. 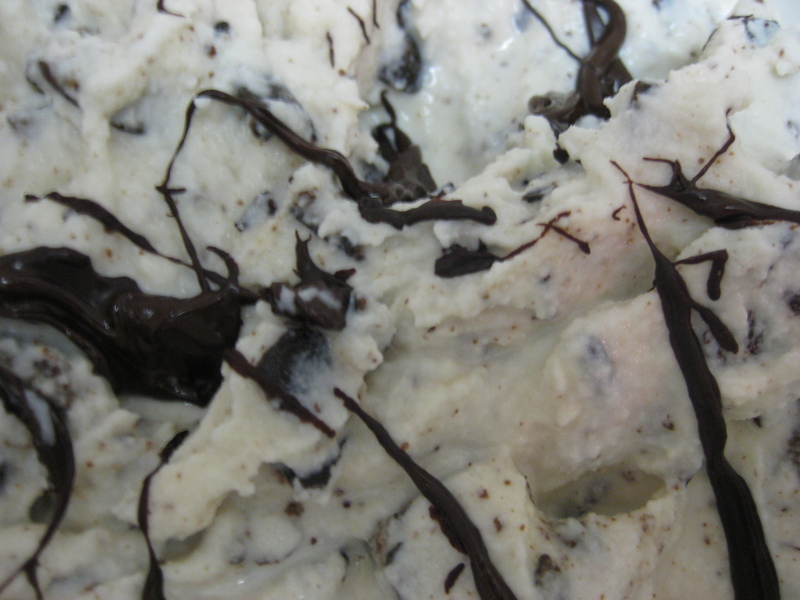 Without further ado… Thin Mint Ice Cream. Mix the half-and-half, milk, sugar and peppermint extract in a bowl until all the sugar dissolves. Pour this mixture into the bowl of an ice cream maker and churn according to the manufacturer’s instructions (approximately 20 minutes). While the ice cream is churning, chop the thin mint cookies into small pieces, making sure that the cookies are still large enough to taste and not too crumbly. Two minutes before the ice cream is done churning, melt the semi sweet chocolate in the microwave, stirring occasionally perhaps every 15-30 seconds to be sure that it does not burn. 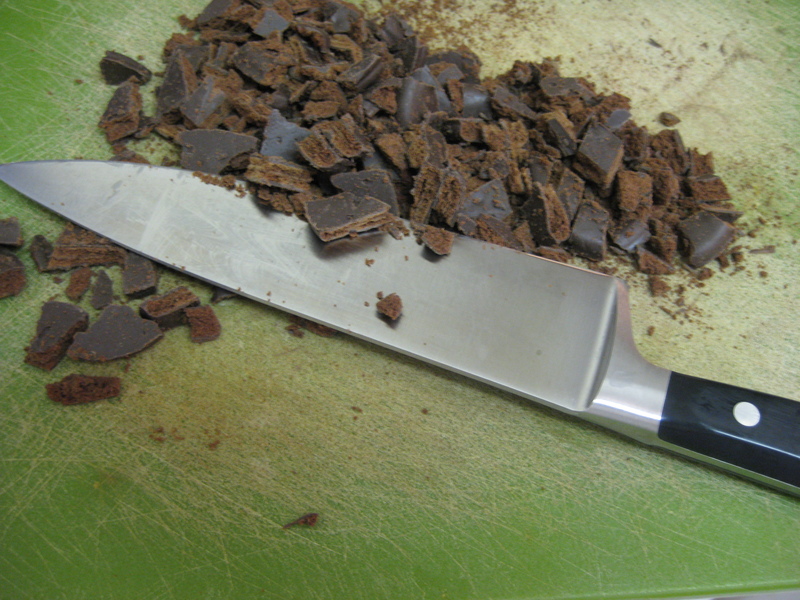 Once the ice cream is finished, you’ll begin layering it with chocolate chunks. Put a few scoops of ice cream in the bottom of the storage container. Using a whisk, drizzle a little melted chocolate on top of the ice cream and swirl with a knife. You will notice that the chocolate freezes almost immediately once it hits the cold ice cream, and turns into thin chocolate chunks. Repeat this drizzling, layering and swirling process until all the chocolate is mixed into the ice cream. Put the container in the freezer for approximately 2 hours before serving. 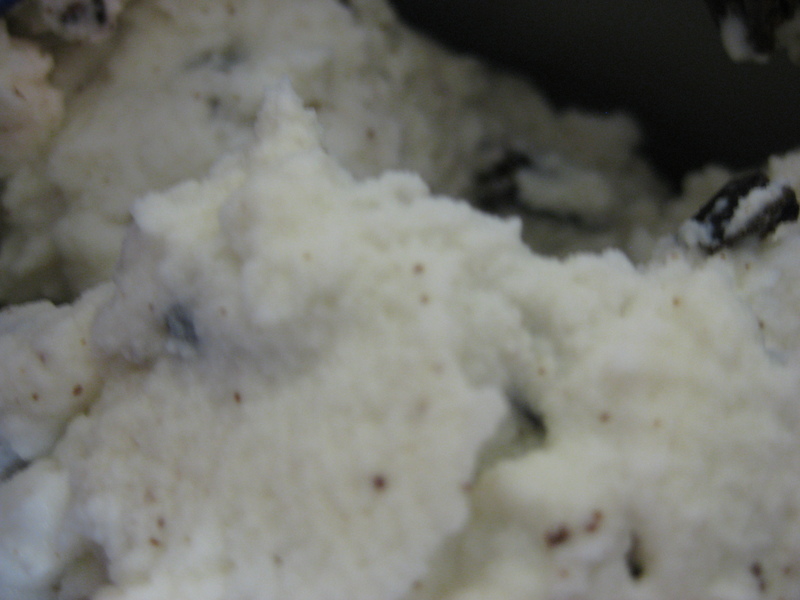 I know I say this in nearly all posts, but remember, home-made ice cream is really best when fresh. In other words, it’s truly most scrumptious straight out of the ice cream maker or a few hours later. The longer it sits in the freezer the more likelier it is to become “icy” simply because of the nature of home freezers storage capabilities. Sealing the ice cream with saran wrap and then a lid helps to lock in the creaminess as well. I definitely recommend eating this one right away. Actually, that’s just what we did! The Verdict: The Husband and I enjoyed many scoops of this delectable mint and chocolate treat and I must say, it was really good! 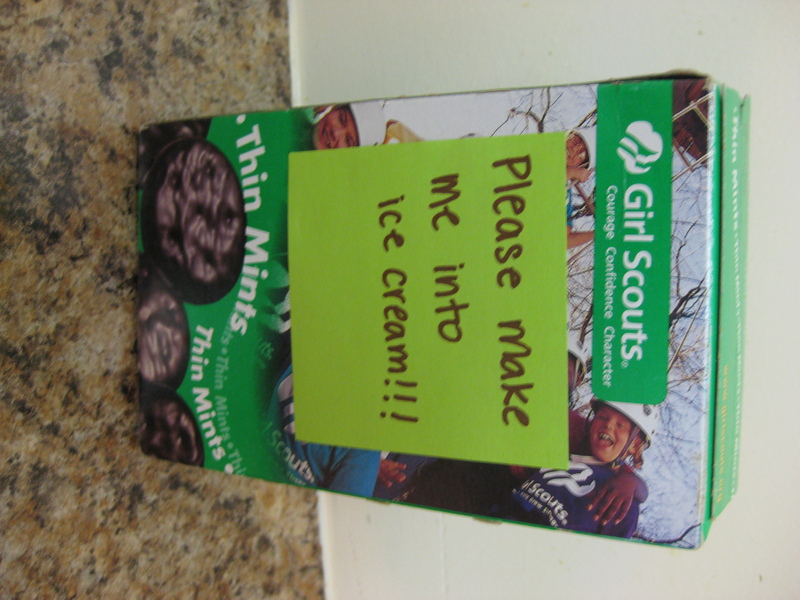 I brought the ice cream to my office and thankfully, my darling, Girl-Scout-Cookie-loving coworker (and friend!) was pleased with her gift. Phew! I hope I’m not getting anyone in trouble here, but I did notice hoards of people in the kitchen stealing bites of ice cream straight from the container. Let’s be honest, that’s the best way to enjoy ice cream, who needs a bowl? Thin Mint Ice Cream mission complete!